For the second year in a row, we’re working with our local Rotary Club to ensure our students and their families can enjoy a happy (and filling!) Thanksgiving. We’ve submitted 10-15 families to the Club. The Rotary Club will then contact the families to confirm their address and other delivery details. 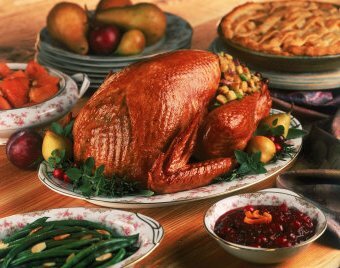 Tomorrow, two days before Thanksgiving, members of the Rotary Club will personally deliver baskets filled with a complete Thanksgiving Dinner! The basket of food is uncooked, so the families are responsible for preparing their own meals, but dinner and all the trimmings will be there—mashed potatoes, cranberry sauce, gravy, vegetables and of course, what would Thanksgiving be without a tasty roasting turkey! The holidays are one of my favorite times of year, but they can be extremely stressful for families living in poverty. With concerns of how they can afford food and clothes on a weekly basis, the extra expenses of holidays only increases the stress. I love how Partnership with Children not only supports students in school, but aids their families as well, especially during the holidays. In just a few weeks we’ll also be distributing toys and gifts to Partnership with Children families across all our schools through our Annual Gift Drive. Regardless of wealth, everyone should be able to enjoy the holidays. It’s a time of family and togetherness—something that we’re able to make possible.